Where: On any public road especially in mountainous areas. 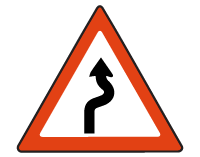 Purpose: To warn of a series of curves ahead. Action: Slow down enough to take the curves safely or stop within the distance you can see. Remember that there could be any number of curves after the first one without further warning.